We owe our love of surfing and swimming, or ‘surf-bathing’ as it was originally called, to our indigenous custodians. Taking to the water in droves, or saving newly arrived settlers who could not swim but would venture out in boats, has been reported as early as 1791. In this instance it was the famous Bennelong who swam with his kin to save those deposited in the water from an overturned boat. In the 18 February 1834 edition of the Sydney Gazette announced that ‘bathing is now the favoured recreation in Sydney’. FIRST OF OUR BEACH MARTYRS SUFFERED IN 1893. Bathers Have Long Waged Battle Against the Killjoys and Self -Appointed Censors One Time it Was Illegal to Bathe in Daylight Australia Still Far Behind Overseas Countries in Seaside Liberty. THE first martyr in the great fight for surfing freedom paid the penalty of his faith way back in 1893. Since those days numberless unknown martyrs have suffered in the cause, victims of the outraged morality of official and self appointed censors. But year by year the sun-cult has increased the number of its devotees. And year by year the irksome restrictions have disappeared though many of the strangest of them remain on the statute books. A couple of summers ago, the beaches began to look brighter and more color-splashed than ever before, and surfers began to acquire atleast some of the freedom enjoyed by kindred spirits in England, the United States and on the fashionable Continental beaches. But 'this freedom' was too good to last. The spectacle of young folks looking happy and athletic always annoys some people, and the result was that censors began to descend on the beaches. Already in Sydney beach inspectors have been busy. And in this State this week regulations, copied from those of Sydney, were expected to be introduced shortly to control beach wear. Modern bathers are almost invariably beautiful, trim fitting and PERFECTLY DECENT And many of those who would sec evil in them would experience a quiver of righteous horror even in the sight of a woman- wearing one of the old CIRCUS TENT CONTRAPTIONS that once passed for a bathing suit. Practically all will pass the regulation test. The fine, under Clause 78 of the Police Offences Act, was £10. IT happened on November 13. 1902. With the girls, the majority had apparently only one flimsy garment on, which clung closely to the figure, and left little mystery as to the shape of the form or limbs it covered.' And when it is said that of these scanty coverings many were much torn, it will be understood that more was disclosed than prudery would prompt. 'Depravity could sink no deeper. That very week new ordinances were rushed into operation. 'The new ordinances,' one official explained, 'will fully cope with the objectionable features. They set out that the costume should cover the body from neck to knee'. ~ The trunks, in my opinion, should be worn inside the dress either that or a singlet — and knickers should be worn. For women, I think that a short skirt is the most becoming costume. SURF LIFE-SAVING. HISTORY OF THE MOVEMENT Great Humane Organisation. Describing the work of the surf lifesaving clubs and tracing the history of the movement from the formation of the first, club in 1903, copies of an attractively illustrated pamphlet reprinted from the 'New Nation' magazine, have been received by the honorary secretary of the West Australian State Centre (Mr. E.M. Scott) from the Surf Life-saving Association of Australia. The pamphlet includes a picture of Western Australia’s champion surfer, Jack Hampshire, who is described as 'a typical Australian beltman.' Open sea rescue and resuscitation during the last 28 years, it is pointed out, has been responsible for the saving of 29 640 lives. During this period no lives have been lost while the patrols have been on duty.' The history of surf life-saving in Australia forms a narrative of heroic accomplishment and steady progress' .states the pamphlet. 'In conjunction with the great summer recreation of surf bathing, the movement has steadily developed until it is now spread throughout the Commonwealth and ranks among the greatest voluntary humane organisations of the world. During the surf bathing season, which usually extends from October to April, the beaches are regularly patrolled at week-ends and on holidays by club members. A strict watch is kept on the bathers and grave danger is often faced in effecting the rescue of persons in difficulty.. There is no material reward for the work. The voluntary spirit in which it was inaugurated has been preserved and this is the feature that has placed the work on the high plane it occupies today. It was not until 1902 that bathing on the ocean beaches became general. As the crowds on the various beaches increased, risks became greater. The problem of how to render proper assistance to bathers in distress inevitably arose. First, the practice of joining hands and forming a living chain was tried, but with little success. Boats were then engaged on some beaches but rough seas frequently made this method of rescue ineffective. Later, thick coir ropes, to which heavy belts were attached were installed in a box on many of the beaches but they were much too cumbersome and formed convincing proof that new methods and transportable equipment were necessary for effective surf work. Necessity for efficient organisation brought about the first of the surf life-saving clubs. The first club to be formed was Bronte, in 1903, when a small band of interested bathers met and decided to form a lifesaving club or 'surf club* as it was then termed. The efforts of these young men were immediately successful. One of the factors in the success of their rescues was an improvised reel to which a line and a large kapok belt were attached. The first reel was designed by John Bond, a staff sergeant of the Medical Staff Corps, but a much improved model was later made by a Paddington coachbuilder. Although the belt served its purpose as a means of buoyancy for the rescuer and patient, it proved in many instances an encumbrance to the progress of the rescuers. Subsequent experiments resulted in the adoption of a much lighter belt. 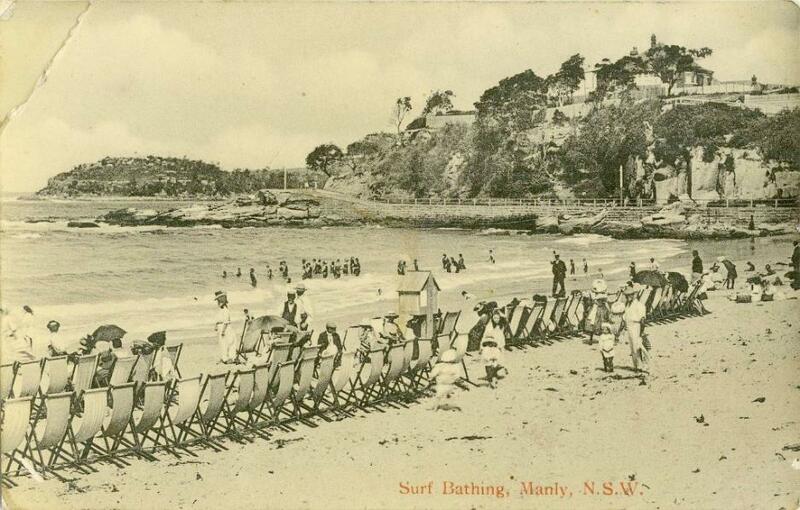 Following the success of the Bronte Club similar clubs were formed on other beaches near Sydney and their efforts provided the public with a means of safety and confidence in surf bathing. The efforts of these pioneers met with great success but it was evident that still better results would be achieved with united action and standardised methods of working. For this purpose a meeting of executive officers of surf bathing and life-saving clubs was convened and held at the Sydney Sports Club on October 18, 1907, when It was resolved to form an association to be known as The Surf Bathing Association of N.S.W. Regulation methods and gear were adopted in 1908 and in October of the following year a surf proficiency test for members was decided upon. On March4, 1910 (incidentally, the year in which the movement was established in Western Australia) the association decided to award a bronze medallion to those members who had attained the required standard of efficiency in rescue and resuscitation methods, reel and line work and a knowledge of physiology. * Public Interest Aroused. SURF BATHING. Mr. Joe Gardiner writes: — As one of the earliest of that indefatigable band of enthusiasts who have done so much to popularise that most 'healthful and exhilarating of pastimes, surf-bathing, I beg to protest most strongly against the action of an inflated Bumbledom on the hunt for a little cheap notoriety. Surf bathing has come to stay, and nothing that the alder-maniacs can do will prevent it. Medical 'knowledge and practical experience of the benefits derived are all on the side of the surf bather, and the sun bath devotee. That, there may be abuses in the matter of costumes by some extremists is at once admitted; but 'why owing to the bad taste exhibited by an in- ?finitely small percentage of surf bathers should the great and growing army of daily dippers in the briny be penalised? There are some things that can be killed by ridicule, and this 'absurd mixture of ci Incline and Turkish highwayman costume is one of them. Had the whole matter been remitted for suggestion and report to the various surf clubs, I feel sure that an amicable and satisfactory arrangement in the matter of bathing dress would have been arrived at. Lord Nelson used to say he had always been a quarter of an hour before his time, and it had made a man of him. It would seem that the average Mayor of a waterside resort is a thousand years behind his time. 'If this agitation results in nothing else than driving a wholesome lesson home to those who think because they have a little brief authority they can take some share in the direction of the universe, it will not have been in vain. Meanwhile the decorous surf bather goes on his way enjoying to the full his daily battle with old Father Neptune, and entirely oblivious of the puny efforts of those who would seek to clothe him in a garb that would be a cross between the clothes of a new woman and a glorified ballet dancer. Bondi Beach, 1906, Charles Kerry image Courtesy State Library of NSW. Powers Of Beach Inspectors . Council beach inspectors in New South Wales and four honorary beach inspectors from each surf club have power to order surfers from the water or" sections of it. The president of the Surf Life Saving Association of Australia, Judge Curlewis, said this last night. He said the Local Government Act in New South Wales gave this power. He heartily supported an attempt by the Mayor of Coolangatta, Alderman L. Peak, to have similar legislation introduced in Queensland. Alderman Peate said he would ask the Queensland Government to introduce legislation giving lifesavers power to order people from beaches and out of the water when the surf was dangerous. AVOID DELAYS. Judge Curlewis said: "I am pressing the authorities in New South Wales to grant the powers to all patrol captains. "This would short-circuit any delays that might occur in emergency situations. "The beach inspectors can order people to surf between the flags. They can also close the beach by crossing the flags. "If people refuse to obey the inspectors, they can report to the local council, which has power to prosecute. "The penalty is a maximum fine of £10." Judge Curlewis said beach inspectors found 99 per cent, of the public most co-operative. The powers were necessary to deal with the 1 per cent, who insisted on knowing more than lifesavers. Surf Bathing at Manly, circa 1905.